Anthea and Seamus, crowned queen and king at the Cercle Français de Belfast's annual fête des rois. The evening, which had attracted a full house was animated very professionally by Vanessa Franchetti and her accomplished team of dancers and musicians. Her team also provided the home-baked galettes shared among participants and helped down with either a glass of wine or cider. 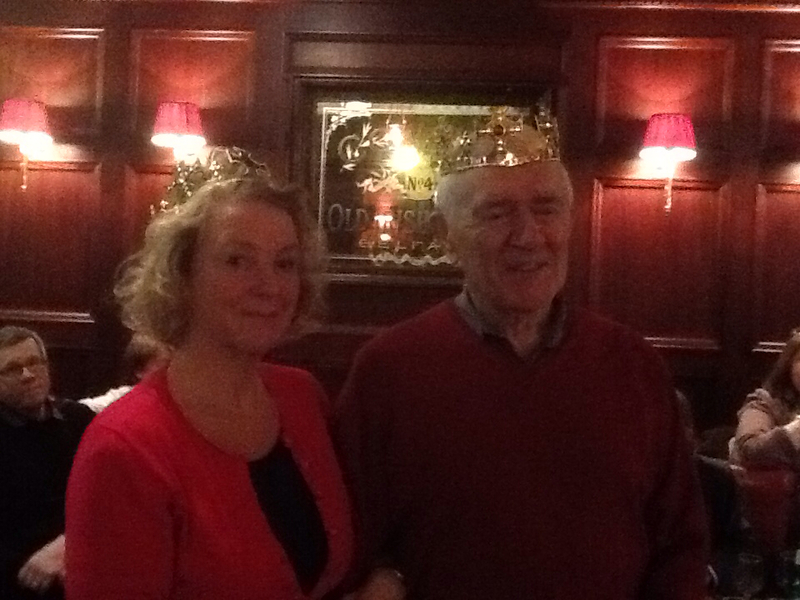 The event included dance demonstrations including an impromptu Can Can from the recently crowned Anthea and Seamus. Here is a short video of a set piece performed by four dancers. The video was taken by Michael and gives some of the atmosphere of the evening. Thanks Michael, and everyone else who came along. Oui, c’est une nouvelle année and what better way to start the New Year than with the Cercle Français de Belfast’s celebration of La Fête des Rois on …. Yes and this year again thanks to Vanessa Franchetti and her troupe for animating this popular event to celebrate La Fête des Rois. There will be galettes and wine and as with all good parties you are very welcome to give us your ‘party piece’- perhaps a poem or a song in either French or English. So don’t miss …. While this event is free to members we do ask for a small contribution of £5 from non-members. In order to help us judge numbers could you perhaps email to me the total number you expect in your party? On 11th January the film of the musical ‘Les Misérables’ will open in a cinema near you. Okay, it’s not a patch on Hugo’s masterpiece nevertheless it does capture much of the spirit of his novel. The French connection is truly there as the music is by Claude-Michel Schönberg and the original French lyrics were written by Alain Boublil.